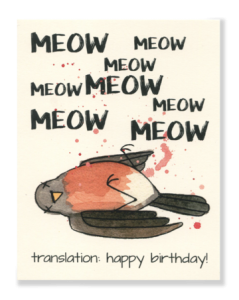 Click through to their website to see all the cute cards, and the themed collections. Wholesale opportunities are available too! Cow Chips Jerky: From Warsaw, IN this small business produces a completely different style and texture of beef jerky … you’ve got to try it and see for yourself! If you’re turned off to traditional jerky because it’s like chewing shoe leather, well you just found jerky heaven. 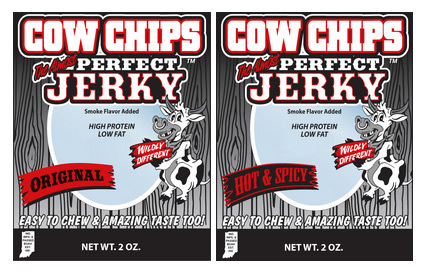 The company name, Cow Chips, derives from two aspects … it’s jerky made from beef (hence the “cow”) and it has the easy eating texture of a potato chip (hence the “chip”). This jerky practically melts in your mouth! A beef jerky company in Indiana … who knew?? 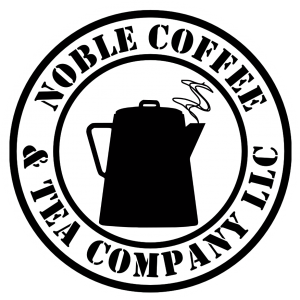 Check out their selection of signature blend, single origin, and flavored coffees at the Noble Coffee and Tea website, or better still visit downtown Noblesville next time you’re in the central Indiana area. We think you’ll agree it’ll be the best cup of coffee you’ve had in a long time! King David Dogs: The last few times we’ve visited Indianapolis, we discovered a great hot dog joint called King David Dogs. They’re located downtown not far from the iconic Soldiers & Sailors Monument (see our “Visiting Indianapolis” travelogue below). When you visit, you’ll see the menu isn’t complicated although you can get your grilled hot dog dressed pretty much any way you like it. They’re 1/4 pound all beef dogs and to say they’re fantastic is an understatement! More importantly, for those who can’t get to Indy, they’re available in five pound packages directly from the King David Dogs website. A really traditional gift from downtown Indianapolis! 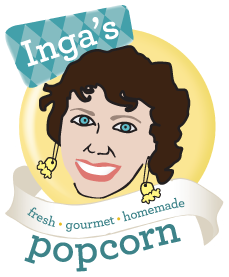 Take a look at the lineup of creative flavors at their website, where you can also order the popcorn for yourself or as a gift. Chocolate Peanut Butter Crunch, Pumpkin Pie Spiced Caramel, Snickerdoodle, and White Cheddar Cheese are just a few – she even makes a variety just perfect for those cold Midwestern nights called Snow Storm, which features caramel along with white & dark chocolate drizzled on top. Sign me up! 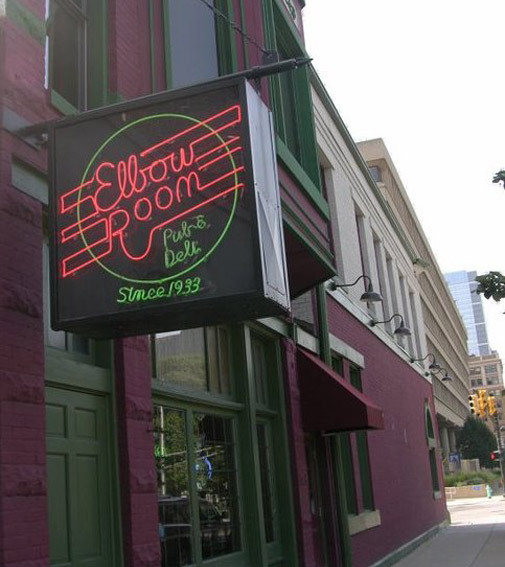 Just Pop In: Over the years, we’ve grown to love Indianapolis. At first (many years ago), we simply drove through on our way to Cincinnati, one of our favorite cities. Recently though, Indianapolis has become a preferred long weekend destination for us – the city is teeming with great restaurants, recreational opportunities, live music, and historical sites. We were particularly impressed with Just Pop In’s connection with their community. 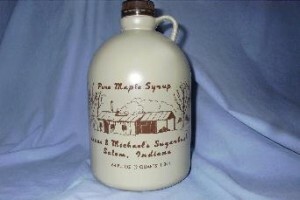 For a great Indianapolis themed gift, check out their “Local Flavors” collection. 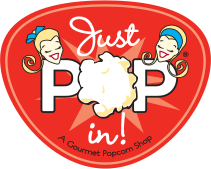 Just Pop In has partnered with other uniquely Indianapolis companies like Sun King Brewing, 4 Birds Bakery, Hoosier Momma and more to create flavored popcorn that pays homage to the specific local business! 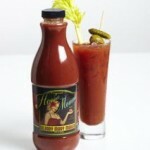 As an example, the “Hoosier Momma Blood Mary” popcorn carries the flavor profile of the excellent Hoosier Momma Bloody Mary Mix (see profile below). A wonderful locally focused idea! You can order any of the Just Pop In specialties directly at their website. They’ve also got a satellite location in the Indianapolis International Airport in Terminal B! Bridgeton Mill was purchased and renovated in the 1990’s and now creates over 40 different all natural stone ground products. Current ownership notes that business picked up significantly in the last ten years when people rediscovered “real” food! Every day, wheat is ground into flour and corn into meal to create products made with minimal processing, no additives, and no preservatives. Choose from Buckwheat Pancake Mix, Blue Cornmeal, Whole Wheat Pastry Flour, and many more. You can shop directly at the Mill’s website and they’ll ship fresh products directly to your door. Great gifts for the foodie on your list! With roots dating back to 1858, Tell City Pretzel Company has been creating their hand crafted pretzels for generations. They’re made from an original recipe and are hand twisted and then baked to perfection. They’re a southern Indiana tradition and are just now being discovered by pretzel lovers in other parts of the country. 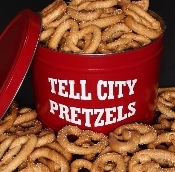 In general, you’ll only find Tell City Pretzels in the southern Indiana area, but thankfully you can order at their online store! You can order them in the Classic original flavor, with extra, light, or no salt, or baked “well done” – whatever your pretzel taste buds desire! A great traditional gift from The Hoosier State! Local Folks Foods: This interesting Indiana company was founded by Steve and Anita Spencer from their family farm in Sheridan, IN. 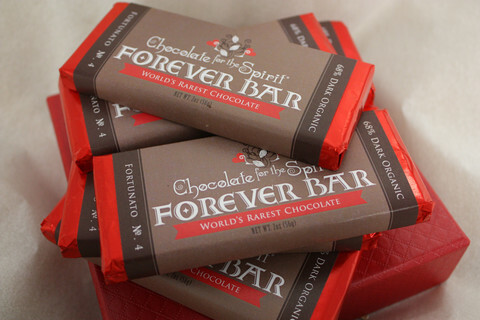 They began creating a line of natural and wholesome foods from simple ingredients that embodied the Midwest identity. They have expanded the business to include other local producers and market the products regionally with the help of food industry experts. Some of the flavors available include Aged Alpine Asiago, Cha Cha Chipotle, Dilly Delight, and Spectacular Spinach. They can be used as dips, spreads, or dressings. All in all there are 18 different flavors, so no matter your taste bud preferences, there’s A Spice Above dip mix for you! 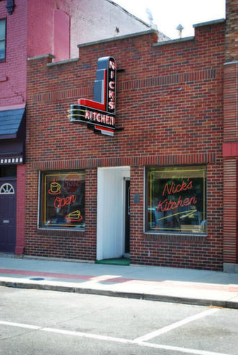 We stopped here not long ago after a visit to the Vice President’s Museum … Nick’s has all kinds of historical photos on the wall depicting the area’s history and it’s a warm, welcoming place in the heart of town. If you can’t make it in person, get the flavor of Nick’s by ordering a sugar cream pie – enjoy! Crazy Charlie’s Salsa: A friend recently brought us back a jar of Crazy Charlie’s Salsa from a weekend trip to Indiana … we were glad he did! Based in Fishers, IN this small company makes a wide range of salsa flavors and related products, including their award winning chili sauce. The salsa comes in mild, medium, and hot heat levels … we had the mild and it is fantastic! They also make an Island Mango salsa, as well as a black bean and corn style. You can use their chili sauce as a convenient base for a batch of chili … just add a pound of meat and beans and you’re all set! 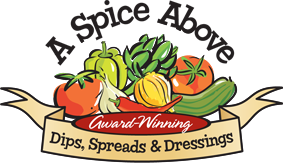 Order any of Crazy Charlie’s products directly from their website … the ingredients are Indiana grown! A year ago, we were given a four pack (four pints) gift package of Sechler Pickles as a gift. You can order the same gift pack, which included Garlic Dills, Sweet Bread and Butter Slices, Candied Sweet Mixed Pickles, and unique Candied Sweet Orange Strip Pickles. It’s easy to tell why Sechler’s has been around for close to 100 years … the pickles are really, really good with just the right amount of snap and crunch! 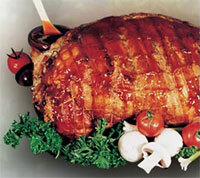 If you can’t find duck products to your liking locally, you can buy duck online at the Maple Leaf Farm’s online store. Some of the many products include duck sausage, appetizers, confit, and even items that are fully cooked! Shoup’s is renowned for their pork. You can order their specialty, the “Mini Hog Roast” online and have one of their bbq sized pork roasts delivered. The roast is completely seasoned and all you have to do is cook it in the oven or on the grill (suggestions are included). 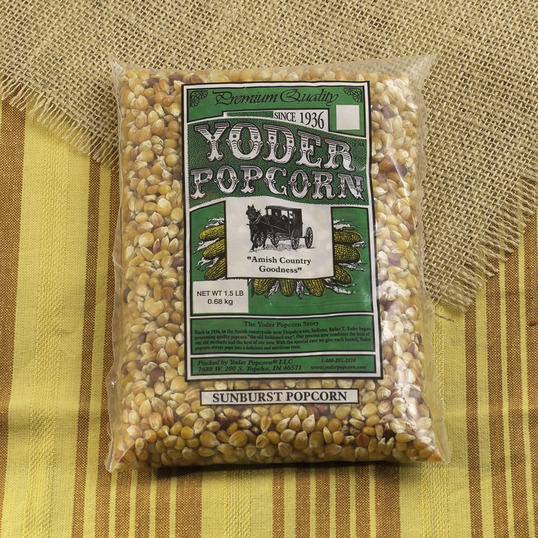 At the Yoder Popcorn website, you can check out all of their popcorn, caramel corn, and gift baskets ready to ship anywhere in the United States. 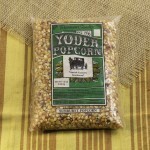 You can also buy their excellent popcorn seasoning and even an old fashioned popcorn popper! The business is The Lotion Company, and they’re known for their full body moisturizer, made in a variety of creative fragrances. They were kind enough to send us samples and we are so impressed – the moisturizer soaks right in and just a little works the whole day! In addition to 24 Hour Skin Therapy, check out the Lotion Company website and you’ll discover products like Farmer’s Hands, the ideal solution for the roughest, driest chapped hands, and Dancer’s Feet, for those hard working soles. There’s Lip Balm too. They’ve got you covered from head to toe! 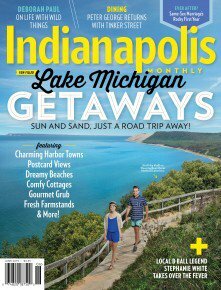 Indianapolis Monthly: Here’s a great economical gift idea for hte Hoosier on your list … a subscription to Indianapolis Monthly, in our estimation the state’s premier dining, lifestyle, and travel magazine. Even if you don’t live within the city limits, this magazine is relevant to any Indianan because their scope of coverage extends to the whole state. We’re very impressed with their travel coverage in particular – there are lots of features on day trips within Indiana, along with up to date information on happenings in The Circle City and beyond. 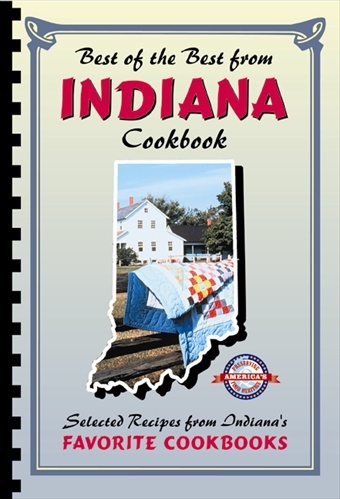 Beautifully illustrated, this cookbook is the perfect gift for any Indiana resident or one who holds the state near and dear to their heart. You can get your copy direct from Quail Ridge Press at this link. 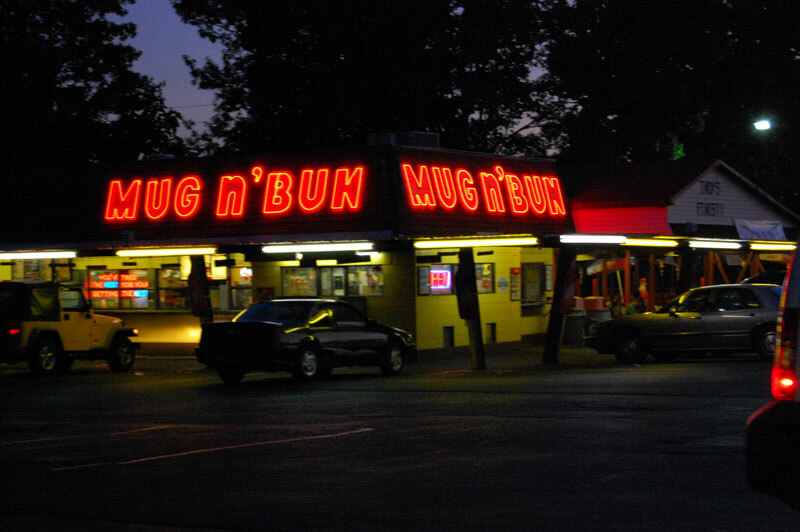 Enjoy the flavors of Indiana! The speedway and grounds are one of the biggest attractions in Indianapolis. The 2.5 mile brick oval track can be toured, and a bus will take you around the track to experience the steep banked curves. You’ll wonder how on earth the race car drivers do it! The 500 is about as Indiana (and America) as you can get. The speedway has an on site and online gift shop where you can purchase all sorts of Indy 500 memorabilia and clothing items. 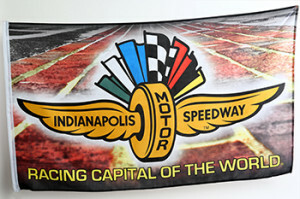 Pictured is a very cool logo flag that’d look perfect in any race enthusiast’s den or sports room! 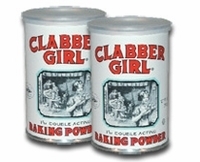 Clabber Girl Baking Products: Clabber Girl Baking Powder has been one of the most trusted names in kitchens across the country for almost 115 years. Based in Terre Haute, Clabber Girl is a company synonymous with baking … their products include not only baking powder, but baking soda, cookie and cake mixes, and more. Shipping across the U.S. is done by PackShipUSA standards and within 200 miles, Weaver Furniture can arrange delivery and set up in your home. Many current and former major league players have used Hoosier Bat Company bats, like Frank Thomas, Magglio Ordonez, Harold Baines and dozens more. You can order baseball or softball bats online from their site, as well as jewelry, clocks, bar stools, and more. The designs are really clever and make for a great conversation piece! Todd and his partner Anna relocated back to Indiana from the Chicago area where Todd taught night classes in pottery. Since moving back to Indiana in 2010, the couple happily devotes full time effort to the creative process. 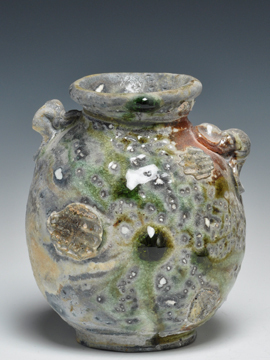 Visit the Pletcher Pottery website and linked Etsy store to see examples of the craftsmanship. These pieces will add a touch of unmistakable beauty to any room! Pottery also makes a wonderful gift – many families pass down specific pieces as legacy items from generation to generation. 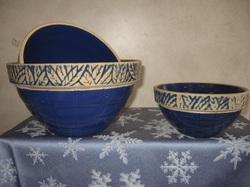 Clay City Pottery’s stoneware is exceptionally functional. The glazes contain no lead, so the pieces are safe for all kinds of foods, hot or cold. Each piece is safe for the dishwasher, oven, and microwave. And you can serve food directly from the stoneware … the pottery helps keep your cooking warm! 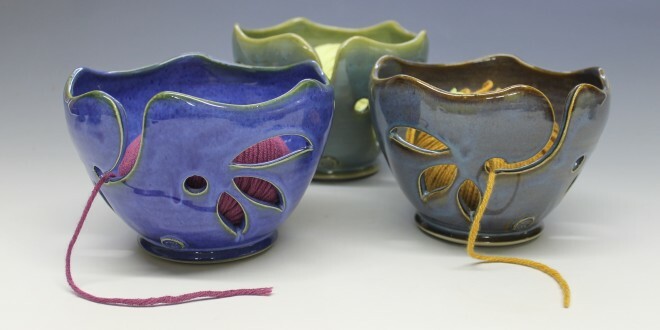 You can order Clay City Pottery bowl items online via their website. An Indiana institution, a gift of Clay City Pottery will be appreciated for years to come! 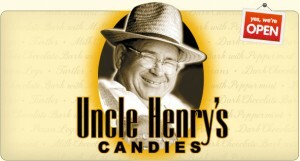 Uncle Henry’s Candies creates their specialty treats for gift baskets, corporate gifts and occasions, special events … and you! 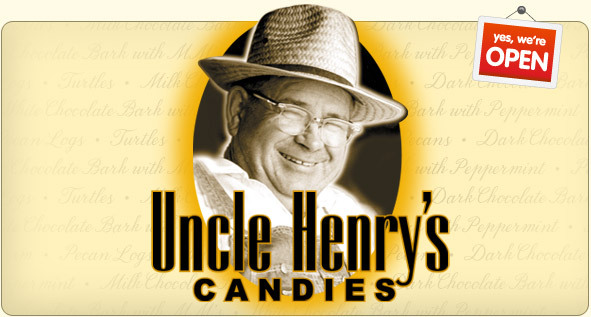 At their website, you’ll see the wide variety of sweet goodness they make, including milk & dark chocolate bark, turtles, peanut clusters, pecan logs, and more. You can order directly from the site and have the candies shipped right to your doorstep, or to anyone who appreciates a Made in Indiana gift! Brooke’s Candy Company has roots dating years before its founding in 2004. When Brooke was a young teen, she made mints for her sister Dana’s wedding shower (Dana and their mom are also involved in the business). The mints went over so well that Brooke was flooded with orders for more, and a passion was born! 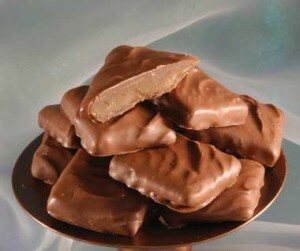 Now, the company makes a wide variety of confectionery treats from their small factory in Dana, including mints, toffee, fudge, caramels, turtles, and more. 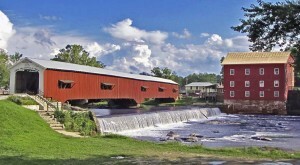 They’ve been featured in Midwest Living Magazine and the TV show Heartland Highways. They were also selected as an addition to the Grammy Bags for the Stars, and word of Brooke’s delicious specialties has been steadily growing! Even if you’re not a sweets person, check out the company’s gluten free mixes for Banana Bread, Chocolate Chip Cookies, and Fudgy Brownies to bring the taste of central Indiana to your home. Along with their chocolates, they’re a great gift idea and available for shipping directly from the Brooke’s Candy Co. website linked above. 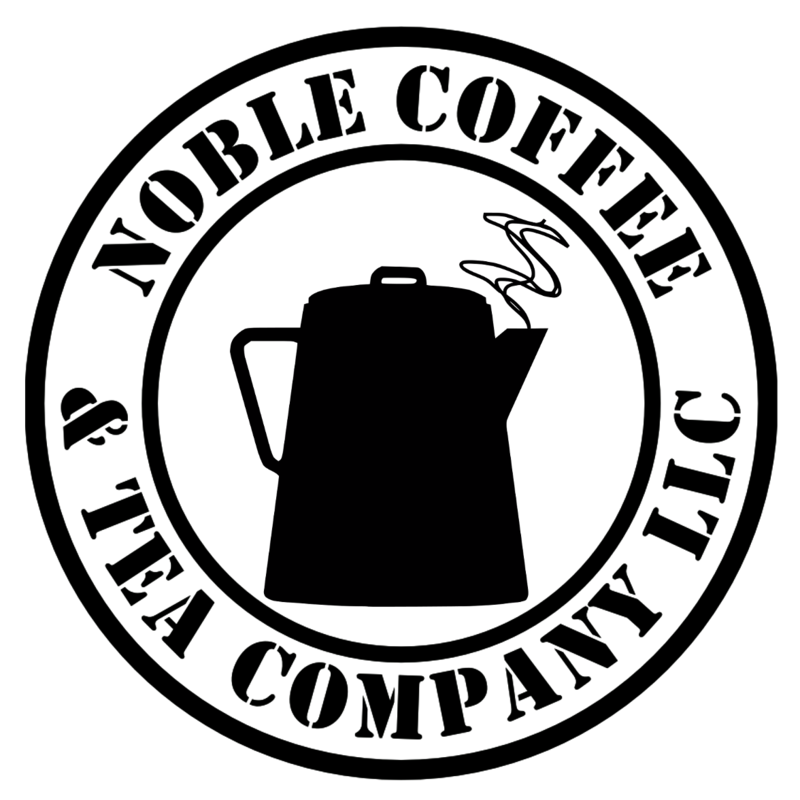 Wholesale opportunities are available as well – check her site for details! Owned and operated by Ryan & Bryna O’Neill, the company hand mixes syrups for both alcoholic and non alcoholic cocktails, only limited by your imagination. The syrups are made with all natural ingredients, including pure cane sugar, and mix well with any of your favorite libations for an added layer of flavor. 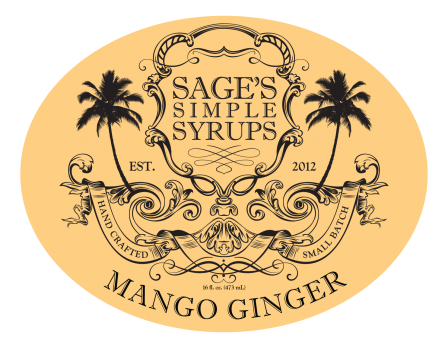 Sage’s Simple Syrups are available at specialty outlets throughout central and southern Indiana (there’s an updated list at their site) and also at their online store. A perfect gift for the mixologist in your life, or someone who aspires to be! 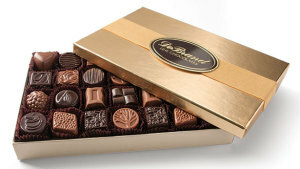 DeBrand Fine Chocolates: Founded in 1987 and with three locations in Fort Wayne, DeBrand is synonymous with chocolate in The Hoosier State. With an array of chocolates and specialty confections, a gift of DeBrand Chocolates is an exquisite gift from Indiana. 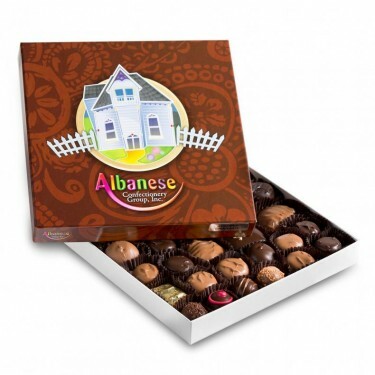 Some of the DeBrand products you’ll find at their website include chocolate covered caramels with sea salt, seasonal chocolates, giant caramel apples, truffles, and many more. One of the most popular gift items is the DeBrand Classic Collection. 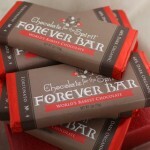 It’s available in various sizes and can be ordered in assortments or by chocolate type. Hint: Try their all natural fruit creams! Visit their site to see all the unique products, chocolate and otherwise! A perfect Indiana themed gift! 240 Sweet Artisan Marshmallows: This Columbus, IN small artisan baking company counts among its many specialty creations the gourmet marshmallow. Now, these aren’t the kind of marshmallows you’d find in a bag at the grocery store … they’re handcrafted with natural ingredients in small batches. The different flavors available have varying densities and textures … an out of the ordinary delicious sweet treat! 240 Sweet creates dozens of marshmallow flavors … pictured is the peppermint chip. Each flavor comes in a variety of packaging, appropriate for both small and large parties! You can purchase online and they’ll ship directly to your home or business. Don’t worry about the marshmallows going stale … they retain their peak freshness level for a month or more! 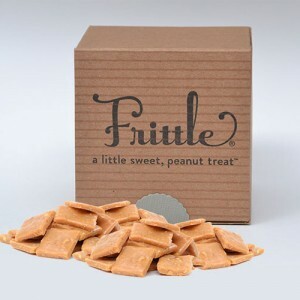 They look like hard candies, but Frittles are actually soft and won’t stick to your teeth like toffee and brittle. They come in a variety of flavors too … original, sesame toasted, and coconut. Give the sweet taste of Indiana! This scrumptious concoction is like a mix of candy and bakery … it has a tantalizing but not overpowering sweetness, and yet the wholesomeness of baked goods. It’s available in four different varieties online. In addition to pecan crunch, you can also order cashew, peanut, and mixed nut. Captain Jim’s Sauces: This small Hoosier State company makes a line of hot sauces created from Indiana grown peppers. Did you know many of the peppers thought to only grow in the Caribbean do quite well in the warm, humid summers here? Captain Jim is Jim Kirk, who got his nickname sometime after the appearance of Star Trek on television in the 60’s. Jim is pretty good at barbecue and in the last ten years or so has tried his hand at making hot sauces, courtesy of a co-workers garden abundance. After giving his sauces away to friends and family for a few years, he was encouraged to market them … and here we are! 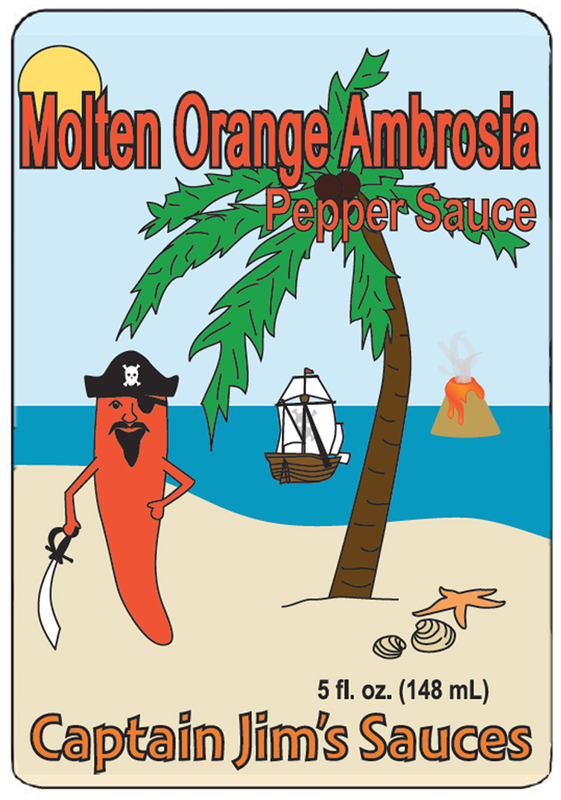 The product line includes five different sauces using habanero, cayenne, and scotch bonnet peppers. Two varieties even feature sweet Indiana made honey! We were able to sample and buy a bottle of Captain Jim’s Molten Orange Sauce, one of the types containing honey. It’s excellent in tacos, on scrambled eggs, and in stir fry dishes. And we’re sure many more culinary creations! You can find Captain Jim’s Sauces around Indianapolis and farther afield (there’s a list of stores at their website) or you can order any or all of them online. A truly local made in Indiana product! Check out their site to learn more about this vibrant endeavor and to order for yourself or as a gift! One of Tina’s most distinctive sauces is called Fistful of Pineapple, and a fistful it is! Kind of like a teriyaki sauce bursting with pineapple flavor, it is augmented by flecks of the rare Dorset Naga pepper, one of the hottest peppers around. Use this sauce with any rice dish – it’s a wonderful sweet & hot sensation! Another unique product, the likes of which we haven’t seen before, is Sangre del Diablo. It’s a spicy ketchup infused with ghost chiles – a wonderful change of pace from standard store bought ketchup. 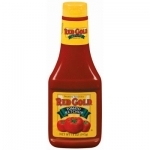 Use it like you would any other ketchup, but prepare yourself for a totally addicting taste bud experience! 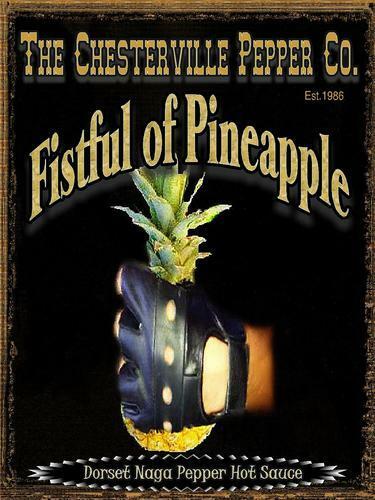 Order any of Tina’s products at the Chesterville Pepper Company online store. Don’t forget to check out their unique salsa line too! Best Boy and Company: This creative and socially minded company based in Roanoke, IN creates BBQ sauces, fudge sauces, and spice blends with all natural ingredients in various flavors. More importantly, 100% of their profits are donated to 501 c3 charitable organizations benefiting families and children … bravo! 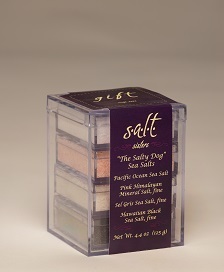 There are also many varieties of salt and MSG free spices available, as well as a zesty product line called JR Mad’s. This line includes everything from a special fish breading to chili mix to bloody mary spices. Everything you need to keep your kitchen humming! Hoosier Momma is a shelf stable product – it’ll hold up for 18 months if unopened and 6-8 weeks after you’ve made a drink with it. 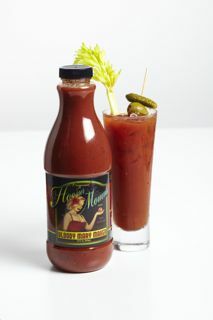 Highly recommended for bloody mary drinkers! Their operation is unique and it provides a glimpse into the pure, natural honey industry (as opposed to mass produced and imported honey). Laney’s Indiana bees produce Autumn Wildflower, Dune Country, Goldenrod, and Wildflower Honey, all of which are available from their website. These, of course, are local Hoosier State honeys, as the bees pollinate flowers within the local area. Other honey offered by the company is created when their bees are shipped to other parts of the country. A good example is their Orange Blossom Honey, where their bees are shipped to Florida during the winter to pollinate the orange blossom plants. Laney Honey also contracts with other beekeepers and it is important to note no artificial flavors are added to the honey … the flavor is derived from flowers located in different parts of the country. All of their honey is natural and non pasteurized, so you’ll realize the many health benefits from enjoying pure raw honey. We bought some from our local specialty food market which stocks various local honeys and it is fantastic! Welcome to our travelogue series “Visiting America’s State Capital Cities”, where we introduce you to all 50 of America’s state capitals. We hope you’re enjoying these as much as we are visiting these cities and writing about them! 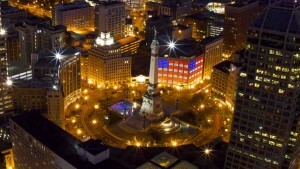 Indianapolis has long been one of our favorite long weekend destinations. From our home in suburban Chicago, it’s a 3 1/2 hour drive, and we’ve been coming here for 40+ years now. Originally, we used to circle around the city on our way to Cincinnati. 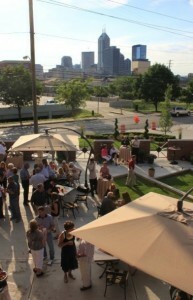 Then over time, we discovered some of Indianapolis’ many charms and made it a stand alone destination. A city that’s very rich in history, this area appeals to everyone. It’s a great restaurant town. They’re crazy about their sports here. The city’s parks and natural vistas are second to none, and getting around is easy. So what’s not to like?? 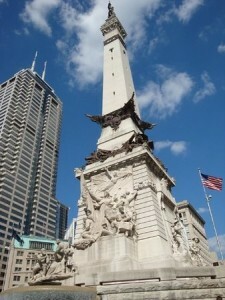 Did you know Indianapolis has more monuments than any city in the United States other than Washington, D.C.? History is honored and respected here, and the city’s centerpiece is the acclaimed Soldiers and Sailors Monument, opened in 1901 and still the downtown focal point. As you’ll learn below, there’s a lot more to discover here beyond monuments and speedways. We love this city and are always pleasantly surprised by something new each time we visit. Join us! 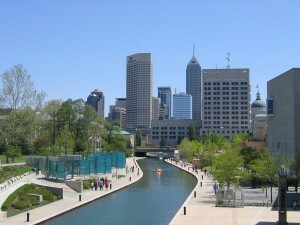 At a population of close to 1 million, Indianapolis is the 12th largest city in the U.S. For trivia buffs, it’s also the state capital city most geographically centered within its state borders. Maybe this is because it’s a “planned” city – in the early 1820’s Indiana’s political leaders literally picked this spot for the capital location. We’ve been visiting here for over 40 years, the first time to see the 1973 Indianapolis 500 (still have the ticket stub!). Since then, it’s been a welcome long weekend getaway for concerts, the restaurant scene, exploration of history, and more. A great place to begin a visit to any city is their downtown. 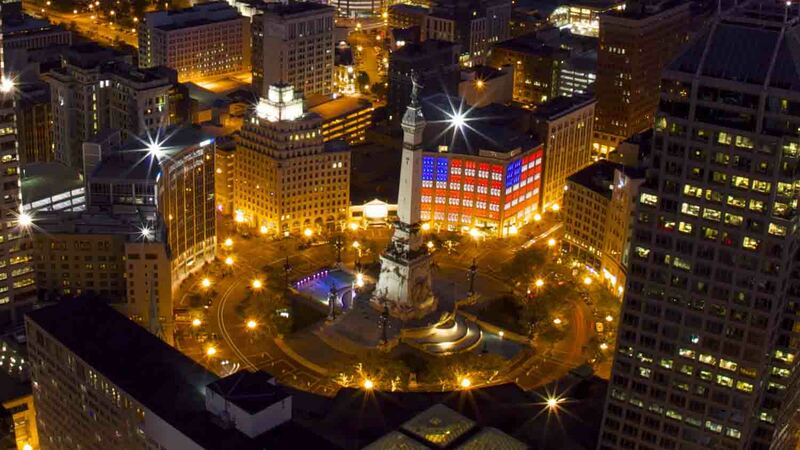 In Indianapolis, this approach is especially ideal because that’s where you’ll experience the iconic Soldiers and Sailors Monument. This monument is the focal point of the city – it stands 284 feet tall and not long ago underwent several years of extensive rehabilitation. Climbing the stairs to the top for a bird’s eye view of downtown is considered a right of passage here, but if your feet aren’t up to it, don’t worry, there’s an elevator! From here, you’re in the heart of downtown. 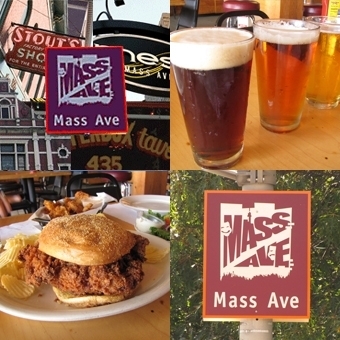 If you’re in town for a sporting event, the city’s main venues are just a stone’s throw away and there are plenty of places to eat and drink nearby. Let’s start with the State Capitol Building as it’s only a two block walk from the Monument on Washington Street. Completed in 1888, this is one of the state’s most historic buildings. It’s made from Indiana limestone and white oak – be sure to see the beautiful stained glass in the rotunda. The Park will draw you back again and again – we see something new every time in town. Concerts are held here, the very underrated Indianapolis Zoo is here, and it’s a haven for walkers, hikers, and joggers. If you’re a history person like we are, very close to Mass Avenue is the stately home of America’s 23rd President, Benjamin Harrison. It’s always worth the time to visit a President’s home, if only to see the handsome architecture of another era. The Harrison Home is surrounded by beautiful gardens and there are informative tours given daily. 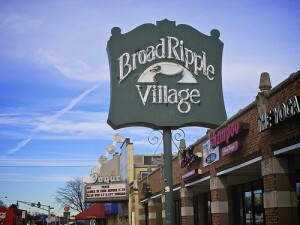 Broad Ripple, located several miles from downtown on the north east side of the city, Is one of the area’s original shopping and dining districts. It’s pretty easy to access off of I-465 and you can get there in 15 minutes or so from the city center. 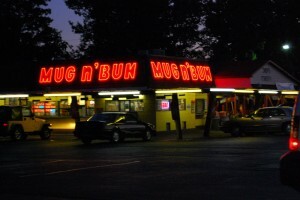 A visit here is well worth it! Last but certainly not least is the famed Indianapolis Motor Speedway. 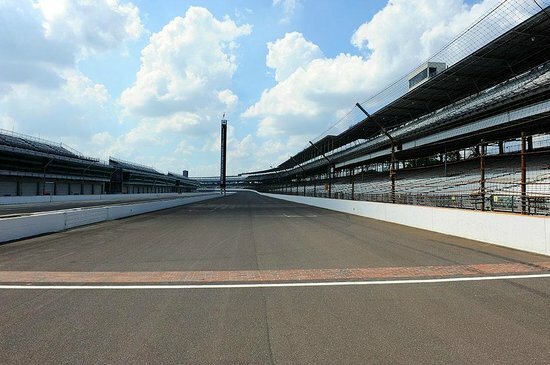 This, of course, is where the Indy 500 race takes place very May over the Memorial Day weekend. It’s one of the city’s biggest annual showcases, so plan ahead because hotel rooms are booked far in advance. 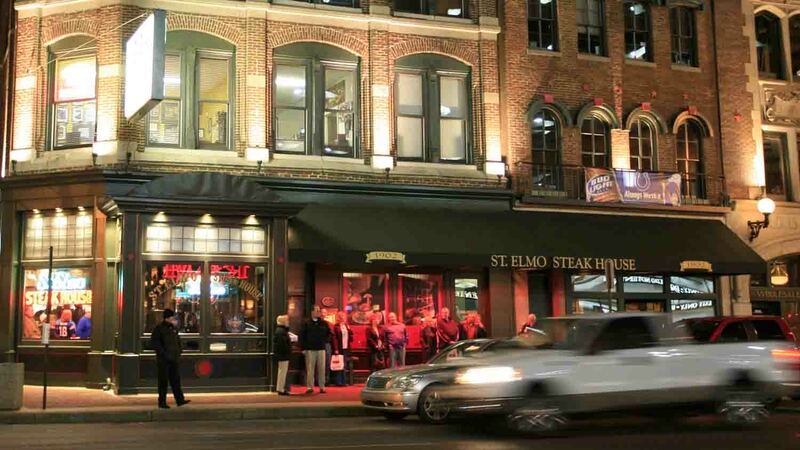 Indianapolis is quite the foodie town, so whatever it is you’re craving, you’ll find it here. Being creatures of habit and big fans of historic, independent places, we tend to revisit old favorites. The only issue with that approach – we keep finding more great places each time we visit! 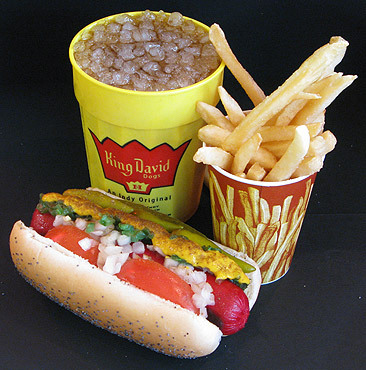 On the complete opposite end of the spectrum is a hot dog place that’s located in the heart of the city – King David Dogs. 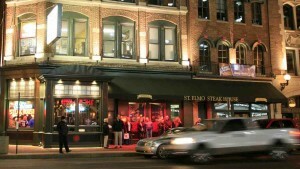 Casual and inexpensive, this joint is just as beloved as St. Elmo’s. If you’re walking and exploring, stop in for a quick lunch. Their menu isn’t complicated – in fact there’s really just two sections of it, “Signature Dogs” and “Not Dogs”. Try the Indy Dog, a 1/4 pound all beef beauty dressed with onions, mustard, and sport peppers. The fries are great and so is the chili! 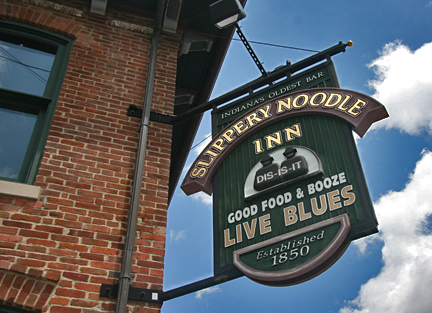 Indiana’s oldest bar (dating back to the 1850’s) is located on Meridian Street a few blocks south of downtown across from White River State Park. It’s the Slippery Noodle Inn, a great blues bar with live music every evening. The Noodle is more known as a drinking establishment, but they’ve got surprisingly good pub food here, including great burgers and wraps. Check out the list of celebrities who’ve been here … it’s impressive! 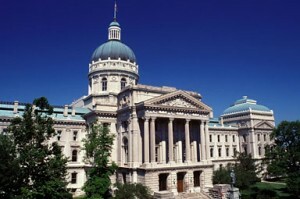 Most folks don’t think of Indiana’s capital city as a vacation destination per se, but it sure is a fun town to visit for a few days! 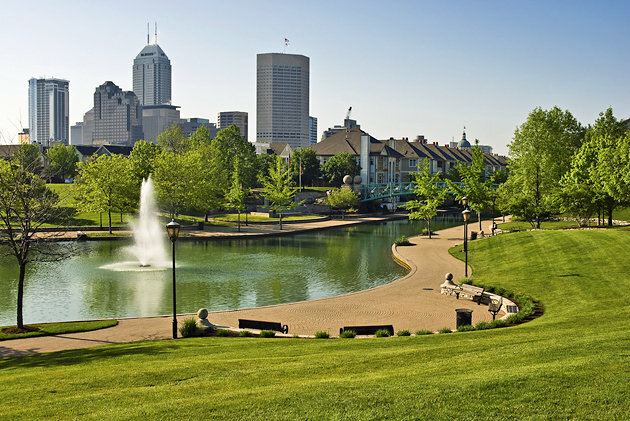 If you’re a Midwesterner, Indianapolis is easy to reach, easy to get around, and there’s plenty to see and do no matter your interests. If you’re planning a visit here, shoot for a long weekend. We love coming here in the mid fall, when days are pleasantly warm and nights are cool and comfortable. But Indianapolis will have the welcome mat out any time of year! We hope this travelogue has given you a useful overview and whetted your appetite for a visit. For more in depth information, including places to stay, check out the Visit Indy website for all the information you’ll need to acquaint yourself with this Midwestern gem. Thanks for reading and enjoy Indianapolis!